First, make a plan of your camp kitchen on paper. You need to determine the exact size of your camp kitchen based on your requirements. Keep in mind the space for your stove and cooking pans as well as easy access storage for your cooking ingredients like spices, canned goods, cornmeal, cooking oil, hot chocolate, coffee containers, etc. After you've completed making the blueprint, cut your plywood into the required dimensions according to the plan. Make sure you sand off all the cut pieces before putting it together. Place the base and start building the sides. Screw all the wood pieces together and align the corners. You can also use wood glue to place the pieces together first and then screw the wood. When you have built the box attach the top part of the box by placing the hinges first. Make sure screws fit the holes of the hinges. Then attach the other side of the hinge to the last piece of the box that will serve as its cover. Attach a locking clasp at the center of the box and screw it properly. Check that the box is aligned. After measuring equal distances from side as well as from top, install metal handles to the sides. 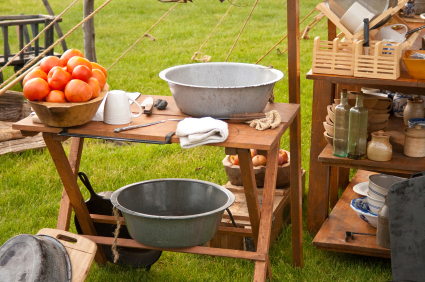 Paint your camp kitchen and apply a layer of varnish to protect it from water.